Today the culture wars are a major topic of debate, discussion, and political action. Abortion, climate change, genetic modifications, and many other issues touch on the question of what human life is worth. For some, human life is extremely valuable, but only in certain contexts. For others, humans are just another species and no more deserving of special treatment than any other living creature. How we see this question strongly influences the response we give to the pressing issues dealing with the value of human life. David Gushee comes to this task with a strong foundation in Christian ethics. He defines himself as an evangelical, but clearly sides with the more progressive (read “liberal”) wing of the movement. To his credit, he draws from a variety of theological sources from conservative evangelical to mainline Protestant to Catholic (especially in the area of social teaching). Mr. Gushee also acknowledges the significant contributions made by the Jewish scriptures and ethical thinkers. The early audiences for the material from which this book is drawn include an eclectic mix of Southern Baptist, conservative evangelical, Episcopalian, Pentecostal, rabbinical, and secular groups. 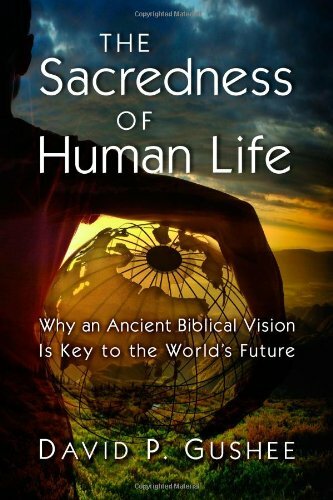 The Sacredness of Human Life: Why an Ancient Biblical Vision Is Key to the World’s Future traces the development of the idea of the sacredness of human life from Genesis through to the early Christian church using Hebrew scripture and the New Testament to develop a theological framework. He then explores the change of Christianity from a faith to a dominant majority that controlled much of the political and social life of Europe. The gradual decline of Christendom and the rise of a secular society led to the sacredness-of-life philosophy to be abandoned. We see the outcome of this approach in the rise of Nazism and the repeated genocides of the 20th century. Mr. Gushee is clear; he does not want to just describe a history or document changes in thinking, but he wants to bring this idea of the sacredness of life to the forefront of the discussion. The bibliography alone is worth the price of the book. Mr. Gushee has 17 pages of references ranging from ancient and modern Jewish scholars, a healthy sampling of Roman Catholic writings, samples from early Protestant theologians and up to the present with both Christian scholars (Niebuhr, Dewitt, Kass, and Bonhoeffer, among others) and secular philosophers (such as Nietzche and Singer) among the secular writers cited. Mr. Gushee has well met his goal of expanding the concept of the sacredness of life to encompass all of creation. The Sacredness of Human Life challenges us, calling on us to rethink our thoughts and ideas with the hope that this sacredness can once again become central to all our lives.